Our Funarena! : The Horrid Truth About A Baby Girl! The Horrid Truth About A Baby Girl! 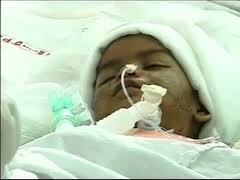 A two-year old baby girl was admitted in a Delhi hospital on January 18, 2012. She was bruised and battered. She had serious head injuries and whole of her tiny body bore marks of torture and abuse. She had been fighting for life since then and as per the latest reports there were a few signs of recovery. The poor child had already suffered two cardiac arrests. Her name is Falak. Her supposed mother, a minor of 14 years, brought the baby to the hospital herself and was detained by the police for interrogation. Later, she was handed over to the welfare department. Her name is Mahi. The teenager ‘mother’ had also a horrid tale to tell. She reportedly confessed to the authorities that she herself abused the baby out of sheer frustration, but the head injury was caused by an accidental fall either from her bed or in the bathroom. Why she was so frustrated that made her abuse her ‘own’ baby? Mahi’s tale went on. She was living with her father who physically tortured her on almost a daily basis. Sick of her miserable life she fled from her home, lived with her aunt for some time and was on the run again. Finally a twenty-something man spotted her and took her to his home. Again a saga of physical abuse followed. To make matters worse, the man one day brought Falak out of nowhere and asked Mahi to take care of her. The minor girl already under tremendous stress could not come to terms with the added responsibility and her frustration started taking toll on the baby. Mahi’s story seems to be only a part of the larger and murkier episode. Doctors say about Falak’s head injury that either a heavy object has been used to or her head has been smashed against a wall. There are also multiple fractures and wounds all over her body. Such brutalization cannot be caused by minor who claimed to be the ‘mother’ first. Police investigations got some leads revealing that the man belonged to Mumbai and had a family there. But he was missing so far. Charges of kidnapping have been registered by the police against him and some other unknown people whose involvement seem pretty clear considering the enormity of the brutal act. The story is in a confused state, but its sordid details are real. In a country that celebrates the international year of the girl child and celebrated the birth of the seven-billionth baby only recently abuse and exploitation of the girl child continue unabated. Feudalistic pockets of the society still hate the birth of a girl child trying to prevent it by any means and the male-female ratio goes on decreasing further and further. Poverty makes millions of other homeless urchins. It’s only the dangerous streets and alleys of the country that strive to take care of the totally uncared lot. Every Indian baby girl just cannot afford to get born to a celebrity family. But Falak now commands the nation’s attention as twenty doctors and thirty nurses are looking after her continuously. Shamed and concerned the nation prays for her recovery. A crying shame! Baby tortured by a minor..And who is to be blamed? ?The root cause is due to poverty ,rejection,abuse and broken home.. If every parent were proud of their baby girl such abuses won't have been a critical issue to India. Can anyone point out just one field where there is no woman participation. On one side the govt. is bringing 33% women reservation & the other side is in front of us. In a country like India where the President herself is a woman its high time, We REACT! Very true. Falak must be a lesson to learn for every Indian. It's now or never! Poverty eradication, spread of literacy, law implementation, welfare activities, NGO activities must be made faster and effective. Everybody, govt. or else must join hands without selfish motives. If there really is a thing called miracle, then this story perfectly fits that. It's amazing the baby had to live another day to endure all those beatings. This is one appalling story that seeks more than just the assistance of spine injury attorney los angeles for that matter. I hope the baby and the mother are in good hands by now. Salman Rushdie: A Test of Indian Tolerance? The Mystery of The Black Ink! Cricket: The Worst Phase For Team India? Cricket:Australia Massacre India in Perth! Husband And Wife—The Law of Equality!